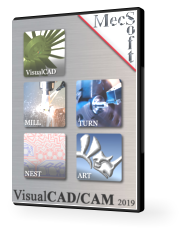 TURN is a powerful 2 axis Turning Center programming system, that is included as a separately licensed module inside VisualCAD/CAM 2019. This module includes Turn Roughing, Finishing, Groove Roughing, Finishing, Threading, Parting, hole machining & free post processors. For a complete feature list of the product features, please visit the product page in our main site.